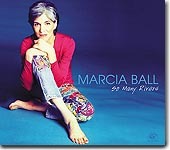 As good as her past CDs have been, the latest from piano player and singer Marcia Ball, So Many Rivers, might be one of her best. It's certainly the hottest thing we've heard in quite some time, and is this month's Pick Hit. Never count soul/blues crooner Bobby "Blue" Bland out. His latest is sure to bring a smile to the faces of his many fans. Read all about it in this month's Surprise pick. Tone-Cool Records gets a gold star this month for releasing a wonderful double-CD retrospective of the career of the great Rod Piazza. It'll take you all the way back to 1966, and covers a lot of territory up until the present. It's this month's Flashback feature. This month's What's New section includes new CDs from Tommy Castro Band and his bandmate Randy McDonald, plus Black Keys, The Delta Jukes, Lucky Peterson, Chuck Strong, Long John Hunter, Carla Thomas, Barbara Carr, and more.